When it comes to clothes shopping, many of us head to the nearest mall. There, we wander store to store, browsing through the racks of similar styles imported from around the world. But we could instead get fitted out in an original designer piece, made right here. High-end fashion has recently popped up in Newfoundland and Labrador, enabling us to be just as fashionable as boutique shoppers in the big cities like Toronto and Montreal. Downhome chatted with three businesses making a scene in the fashion world, while at the same time supporting local businesses. Standing on the water’s edge in Quidi Vidi village is the Plantation, a space for artists to work and sell their crafts. It’s also the home base for Newbornlander, a new business with a line of chic children’s clothing. You won’t find cartoon bears or overdone pastel colours here, and that’s on purpose. These designs are simple and elegant. When Constanza Safatle was looking around for baby clothes, she didn’t like what she saw. So she bought a sewing machine and fabric, watched a few video tutorials and started to make her own baby bibs. “Then I started to develop other kinds of products and then never stopped,” she says. And that’s how Newbornlander got its start in 2017. Newbornlander makes bonnets, hats, booties and other items, as well as tents for newborns to two-year-olds. The fabric patterns are classy, with animal and floral prints. Constanza’s husband is a fishing engineer, so she likes to use nautical themes in the fabric, which blends nicely with this province. “They’re stylin’,” Kerri adds. Constanza explains that while babies are wearing Newbornlander, it’s being sold to the parents who actually dress their kids. She’s seen it with her own firstborn, now two years old and starting to point out what patterns he’s drawn to. “I think when you go to the babies and the newborns, you need to think of the mom,” she says. 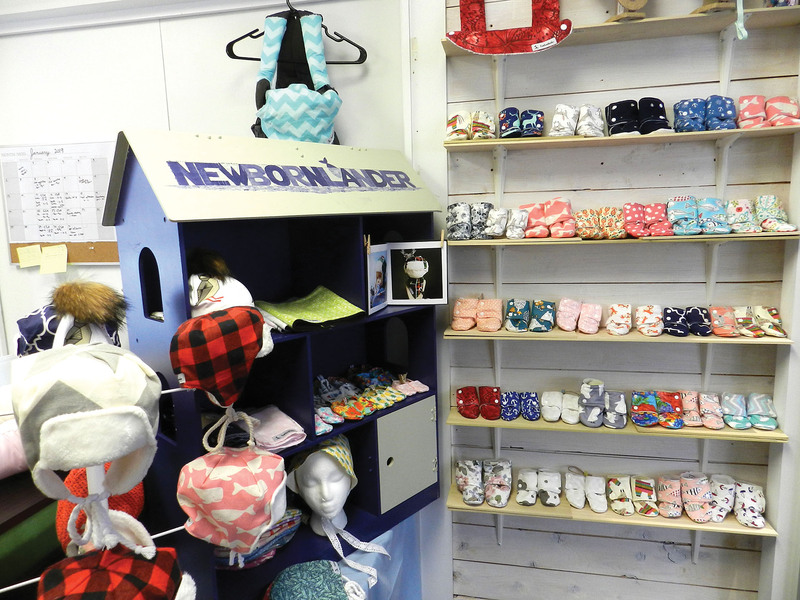 People can purchase items at Newbornlander’s studio at the Quidi Vidi Village Plantation or order online through their Facebook page. A website is next on the wish list, Kerri says, which will make it easier to reach new clients, espec-ially as they’re getting more orders from outside the province. Newbornlander helped Constanza set roots in the province when she first moved here. For the immediate future, she and her young family will be staying here, but she does miss being a lawyer. “One of the things that attached me to Newfoundland is this, to have the opportunity to make a business. Now I have a partner like Kerri.” So even if she relocates back home, Newbornlander can continue with Kerri here and Constanza in Chile. When Megan Sooley of Sooley Designs sits down to create a new piece, she gets her inspiration from the fabric. When she sees a fabric in a store, she can envision what it will be after she gets her hands on it. “The fabric, pretty much to me, builds the piece. It screams what it is to me. I’ve got this new piece of fabric and it’s kind of a furry, pink thing, I don’t even know what to call it. And it’s a sweater. It’s a big, comfy, cozy, over-the-top sweater,” she says. Megan’s designed everything from loungewear to wedding dresses. “I can make clothes for any size woman, any body really. And I get a lot of inspiration from my clients in that way. So if somebody’s looking for a dress that is flowing, comfortable, but they want to show a little bit of skin but not too much - trying to work with all those elements.” It’s a challenge she enjoys. With a professional artist for a mother, Megan had an artistic childhood. She got her first sewing machine at age nine. Using whatever materials she could get her hands on, she made purses out of old jeans and dresses from curtains. At the age of 20 she decided on the spur of the moment to travel to Montreal, hitching a ride with a friend who was headed to Toronto. “And I had no plans whatsoever, really to go,” she says. “I just had noticed this school. I hadn’t applied or anything like that. And the next day he came and picked me up, and I had a suitcase and a sewing machine and I left.” Megan then applied to LaSalle College and graduated in 2010. After school, she lived in Europe for a while before returning to Newfoundland and Labrador to work as a technical designer. Her work led to a repetitive strain injury from sitting at a desk, and she lost her job. With no money, Megan moved back home. Borrowing $20, she bought enough fabric to make a sweater “because it was the only way I knew how to make any money,” she explains. She quickly sold it online, which brought in enough money to make two more sweaters, which also sold. Sooley Designs started from there, and has been so successful that in 2018, the Newfoundland and Labrador Organization of Women Entrepreneurs (NLOWE) presented Megan with the Young Entrepreneur Award. Currently, Megan employs three seamstresses and a saleswoman in her downtown St. John’s store, plus she recruited her mom as a seamstress and bookkeeper. At any given time, Megan can have 150-200 orders to fill, as well as people scheduled for fittings in the store. “I like to get to know my clients, each and every one. And I like to give them enough time with me.” So she typically only has two or three consultations a day for that reason. Most of Megan’s clients are locals, but she does get some people from out of town and some from out of province. Just the other day a woman come into the store who’d lost her luggage and had a wedding party that night. Megan says it made her think, “If she doesn’t find something here, I’m not doing it right.” The client ended up leaving with navy blue polka dot dress. Megan says she has no interest in going to the big fashion shows (think Paris, New York etc. ), which costs a lot of money to attend. Instead, she uses her position to promote local talent, helping host fashion shows with the proceeds going to charity. Vogue photographers and models come here to do photo shoots, Megan says, “and I’d much rather show my clients and my people what I’m doing and let them experience it,” she says. Growing up in Deer Lake, MJ was in junior high when she started sewing with her mom. Originally using store-bought patterns, she remembers the first thing she made was a green crepe mini skirt. Now she’s making a name for herself with her own designs, attracting clients all over Canada and the US, and the list is growing. A highlight so far was MJ’s invitation to fashion week in London and New York City last year. “It was pretty wild, it was definitely a great experience,” she says. Since then she’s continued to focus on growing her business in St. John’s. Currently, MJ has a studio on Bates Hill where she sells her clothing and meets with clients by appointment. Shoppers can also find her pieces nearby at Johnny Ruth on Water Street, and she’s in the process of developing an e-commerce website in hopes of reaching new clients and giving them an easier way to shop. A lot has changed since starting Melanie Jacqueline, but some things have remained the same. MJ is the only person sewing and has a sales assistant who works at the shop. Always looking to innovate with other locals, for MJ’s recent collection she teamed with artist Sara Dillon of SJ Artworks to create a series of fabric prints. “It was custom Melanie Jacqueline fabric, not to be found anywhere else. And it was very true to me and my personality and some of my story. So that was really exciting,” MJ says. As Newfoundlanders and Labradorians, we tend to sometimes take for granted the beauty that surrounds us. With picturesque communities and coves at every turn; more berries, wildflowers and wildlife than you can shake a stick at (which you probably shouldn't do should you encounter one of our many moose! ); and some of the best hiking, camping and wilderness experiences that youâll find anywhere, it truly is a nature-loverâs paradise. But thereâs no need to tell Shaun Majumder. He already knows.As one of the stars of CBCâs âThis Hour Has 22 Minutesâ (who also appears in the upcoming Hatching, Matching and Dispatching film this December), and a familiar face at comedy festivals around the world, the Burlington, NL native is perhaps best known for being foolish. From his hilarious impressions of fellow Canucks like David Suzuki and Ian Hanomansing, to his alter ego Raj Binder (the nervous and excessively sweaty Indian reporter), he has funny coming out of his pores. But today, he offers a rare peek at his serious side. Fire, Food & MusicA few minutes with Shaun is all it takes to realize that while you can take the boy out of Burlington, you canât take Burlington out of the boy. He simply exudes hometown pride and has spent the best part of the last decade working towards exalting the reputation and lure of this tiny Baie Verte Peninsula community (population approximately 300).It all started a few years back when Shaun, who was pursuing his acting career in Los Angeles, decided to buy his old school house in Burlington.âThat was what sort of started it, because I just wanted land in Burlington because I loved it, and I wanted to go back there and eventually build a house,â he says. Over time, Shaunâs plans morphed into something far bigger. He set out on an ambitious path to turn his beloved Burlington, a town with no restaurants or accommodations, into a world-class tourist destination. It began with plans to build a $2.7-million lodge - a process documented for TV and aired on the W Networkâs âMajumder Manor.â By the time season one had wrapped, Shaun and crew had built a big community greenhouse and decided to throw âa little harvest partyâ to celebrate. They invited local musicians and chefs (and set up prospector tents to house them), and people all over the peninsula. Thatâs how The Gathering was born. âWe were trying to test somethingâ¦we werenât even thinking at that time, âLetâs throw an annual festival,ââ Shaun says. Shaun had cast a proverbial pebble into the pond - like the ripples ever broadening, his vision grew. The next year, Shaun and co. decided to expand upon their harvest party by adding chef hikes featuring local foods like mussels and moose. âWe created the chef hikes based on the idea of, letâs do what people have been doing here for years - hiking through the woods, down into a beach, have a boil-up on the beach - but letâs elevate it. So letâs have the chefs prepare a gourmet feast over open flame, and letâs have musicians play out there while youâre enjoying your boil-up,â Shaun explains. Five years later, The Gathering has become a highly anticipated summer event. With the tagline âFire, Food and Music,â it strives to get folks back to nature, while celebrating the cuisine and culture of the province that Shaun loves so well. 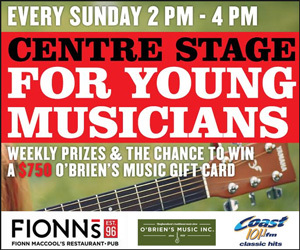 In addition to renown local chefs and some of the best music the province and country has to offer (this yearâs festival featured the likes of The Once and Bud Davidge of Simani fame, along with Nova Scotia father-and-son duo Bill and Joel Plaskett), the event includes comedy shows, shed crawls, a âJiggâs Dinner Supperâ and more.Giving BackThe Gathering, and the greenhouse, is just part of âOME (a nod to the local accent), a non-profit social enterprise that aims to create a sustainable micro economy through tourism in the Burlington-Smithâs Harbour-Middle Arm area. Other pieces include the âOme Fry chip van and âOme Sweet âOme accommodations, which include Newfoundland-made glamping tents, a guest pod (like a cabin) and, eventually, the lodge.Shaun's foundation takes camping up a notch with these luxuriously furnished, Newfoundland-made tents.All profits and revenue generated from the enterprise are reinvested back into the community. Shaun is also using âOME to encourage locals to tap into their entrepreneurial spirit. One youth, for instance, has been using his quad to ferry guestsâ luggage to and from The Gathering grounds (usually making close to a couple thousand dollars over the weekend). âIn rural Newfoundland, back in the day, we were built on entrepreneurs,â Shaun says. 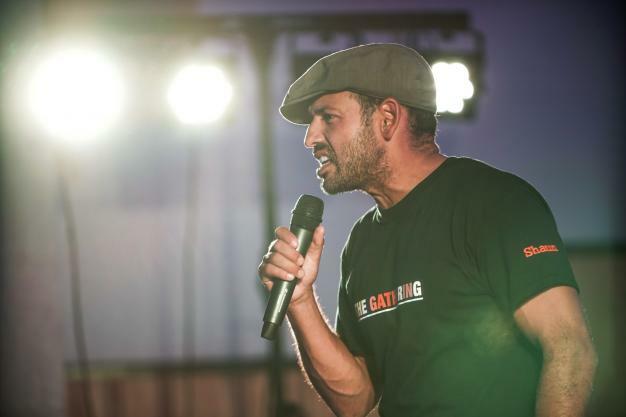 âWhat we need to do is also try to inspire and encourage people to think in terms of not waiting around to get a job, but to create [their] own business and be totally in control.âThis summer, Shaun took several of The Gatheringâs featured acts on the road, with stops in St. Johnâs, Gander, Grand Falls-Windsor and Corner Brook. He hopes to take it to more out-of-the-way places in the future, to help open peopleâs eyes to the possibilities that exist in rural Newfoundland. âAll it is, is you need a place to stay and a place to eat and something to do. Burlington has not had any of that. We started from zero. There was no wharf, there were no hiking trails, there are no hiking trails still. Thereâs no infrastructure...thereâs nothing there - but thereâs everything there,â he says. âIf I were to put it down on paper and look at the trees we have, the topography we have, the coves we have, the exploratory ability of kayaking and snowmobiling and the remote camping opportunities that we have in Burlington - Green Bay, really...itâs an untapped place that nobody has ever really looked at as a tourism opportunity.â For Shaun, âome is definitely where the heart is - and he hopes others might follow his lead, and their hearts, as well. âThe idea is if this works in Burlington, Middle Arm and Smithâs Harbour, we want to replicate that and possibly take it to other communities all over the island and say, look, hereâs the model,â he says. âYou can have so much where you are. You just need to rethink where you are and what you are.â - By Linda BrowneLearn more about The Gathering and âOME at thegatheringburlington.com & omesweetome.com. Below, watch Shaun take our 20 questions challenge. Warning: this video contains some colourful language. Man O'War Ridge is silent under deep blue skies as it looms beyond the craggy crevasse known to locals as Crow's Gulch and, as far as the eye can see, not a breath of wind disturbs the placid waters of Colliers Harbour. It is a proverbial large day in mid-March (2017) - and the perfect conditions for my planned activity. I watch as 74-year-old John McWilliam, clad in the ubiquitous red-plaid shirt of woodsmen everywhere, pours off the harvest of maple sap from his six tapped trees. Streaming into a larger bucket, the liquid will be boiled down over several hours into maple syrup. John recalls being gifted the trees as very skinny seedlings back around 1984. He planted them himself, and today the largest of those maple trees tower above nearby telephone poles.We while away an enjoyable afternoon going through the process (along with Johnâs daughter, Tina). It is the very first time any of us have made maple syrup. Nursing warm cups of coffee in the lee of the trees while the fragrant sap boils away on an outdoor burner, John remarks, âIt is really something; I never would have believed that when I planted those little trees all those years ago they would grow big enough to make maple syrup from them. It is not all that hard to do, just check the buckets daily so they donât overflow, really, and then boil it all down when you have enough. It has been fun.âJohn McWilliam and his daughter, Tina, with the maple syrup they made from their own tree sap.At the end of the season I check back and learn that John and Tina continued collecting sap until April 9 - and ended up making about 5.25 litres of delicious syrup, which they gave to grateful family and friends. Thatâs a whole lot of maple syrup - but itâs only a drop in the bucket when you consider how much of it is mass-produced in Canada: 40 million litres annually, enough to fill 17 Olympic-size swimming pools. According to Agriculture and Agri-Food Canada, that boils down to approximately 75 per cent of the worldâs maple syrup supply. Itâs produced on more than 10,000 maple farms, more than 70 per cent of which are in Quebec.Regardless how much of it you make, however, the rudimentary process remains the same and is referred to as âsugaring.â It involves boiling sap from trees to evaporate most of the water content, thus creating concentrated sugar syrup. A simple candy thermometer will tell you when the syrup is ready, and consumer kits provide very straightforward directions for beginners.Maple Syrup SchoolTo find out more about the local syrup scene I attended the third annual Maple Festival at the North Bank Lodge in Pippy Park last April, where I met organizing committee member Steve McBride. The St. Johnâs resident is passionate about food security, and is perhaps best known around town as the owner of several goats, beloved pets kept for fresh milk and companionship. Thanks to the Maple Festival, Steve is also becoming known for making maple syrup.âWe have been making our own syrup in St. Johnâs for the past eight years, but about four years ago we began working in cooperation with Pippy Park to teach maple syrup workshops, and that has now culminated in a celebration of maple syrup culture, which is the festivalâ¦âPeople can come and we teach them about maple syrup and how to make it, the tapping process, what the equipment looks like, how to tap a tree, and it is really a back-to-basics approach,â says Steve. âWe hang a bucket on a tree just like they used to do in the 1800s, and that is the method we use up here in Pippy Park in our community maple grove. We tap about 70 trees here, which is enough to make the syrup that we share at the festival.âA crowd gathers in Pippy Park for a maple tree tapping demonstration.Maple tree sap is boiled down to make syrup during the 2017 Maple Festival at Pippy Park in St. John's.Steve says the provinceâs weather makes it a good place to practise the hobby, even though Newfoundland and Labrador typically doesnât have the really large sugar maples found in other provinces.âOn the mainland the tapping season lasts about two weeks, but here the conditions [below freezing at night and above freezing in the day] linger and we can have a tapping season as long as eight weeks. So the trees are smaller and the flow is slower, but the longer season makes up for it.âHe says any type of maple tree can be tapped - not just the sugar maple (though sugar maples are generally better at sap production). A typical yield, he adds, is about 40 to one, meaning 40 litres of sap will result in one litre of maple syrup. âThis explains why real maple syrup is so expensive to buy in a store. It is a little bit labour intensive and does take a fair amount of time to make,â he says. Given all of this, I wonder why so many are drawn to making their own. For Steve, a variety of factors make the effort more than worthwhile.âI like the fact that it connects you to the trees. I like the fact that it tastes better. Of course, here in Newfoundland March is a kind of tough month for people. We have windstorms, we have snowstorms,â says Steve. 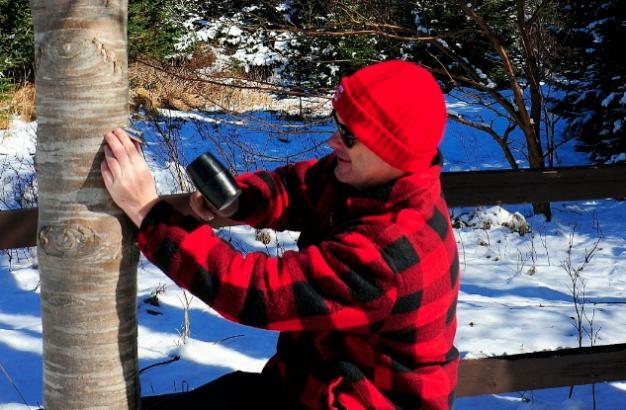 âMaking syrup kind of fills that gap while we are waiting for winter to end and allows us to get outside and start doing things.â And since store-bought syrup costs three times more than tapping your own, he points out itâs also economical. The Friends of Pippy Park sells six taps (called âspilesâ) for about $20, which can produce enough syrup to last all year. Many local businesses and mail order companies sell starter kits complete with several taps, buckets, hangers, covers, the proper drill bit and instructions for $100-$200.While the resulting maple syrup may be reward enough, festival patrons share with me multitudes of other uses for the sweet stuff: maple butter, maple wine, maple taffy, plus recipes for maple-based waffles, pancakes, popcorn, salmon and chicken - just to name a few. Among the unconventional uses for maple syrup - wine.Maple syrup makes many things taste better, including salmon.In addition to the demonstrations, last yearâs festival featured free hot chocolate, samples, a tasting competition (open to members of the public to enter their syrup for good-natured judging) and a performance by The Teddy Bear Man, Terry Rielly.The maple syrup workshops and festival are free to attend, though donations are graciously accepted. Future plans for the park include a new sugar shack, where folks can prepare their maple syrup in a communal setting.Whether boiling it down in your own backyard, or enjoying the sweet atmosphere of fun and friends at a festival, makers of maple syrup have really tapped into something good. - Story & photos by Dennis FlynnFor news on this year's festival, visit: facebook.com/friendsofpippypark. 1. Raise a Glass: The Port Rexton Brewing Company has been brewing local craft beer since last July. Buy a glass and relax in their tasting room.2. 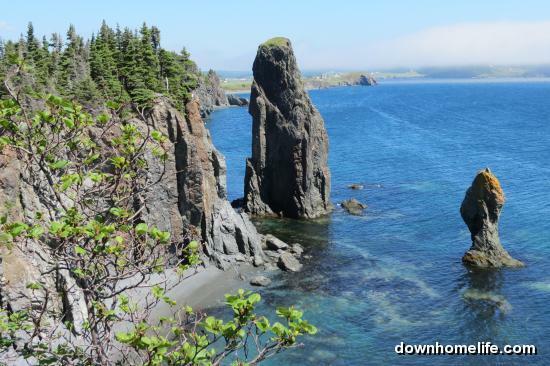 Take a Hike: The renowned 5.3 km Skerwink Trail brings walkers along the coast to some of the provinceâs most stunning views of sea stacks. 3. Hit the Water: For anyone keen to see whales up close, try a boat tour with Sea of Whales Adventures. The trip out is about 3 hours long and groups are kept small (between four and 11 people per tour). Tours still happen in October, but are weather-dependent.4. Eats & Treats: Overlooking Port Rextonâs Robin Hood Bay is Two Whales Coffee Shop. Itâs the perfect spot to grab some delicious, locally sourced vegetarian food and sweet desserts! It closes Tuesdays and Wednesdays, and is done for the season by the end of October.5. A Place to Stay: Located on top of a hill overlooking Ship Cove is Port Rextonâs Fisherâs Loft, a 4.5 star inn. What started as a simple Bed and Breakfast eventually grew into three buildings whose designs are based on architectural styles from the 1866-1920 period. Did You Know? 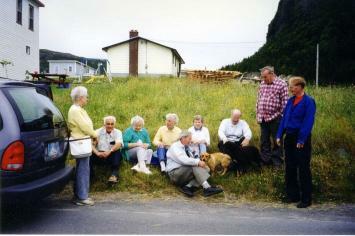 In 1910, the neighbouring communities of Ship Cove and Robinhood made the decision to band together under a single name. According to the Encyclopedia of Newfoundland and Labrador, the choices came down to Port Rexton and Port Randell. In the end, they went with Port Rexton because Rex was the family name of the first male child born in the community.For one more reason to visit Port Rexton, click here to find out about its "singing staycation."